Several of John Singer Sargent’s works feature another artist as a model, together with his beautiful wife: Mr and Mrs Paul Helleu. Below, for example, is the best-known of these, usually titled rather unhelpfully An Out-of-Doors Study (c 1889), although sometimes fleshed out as Paul Helleu Sketching with his Wife. So who were they, and why don’t we ever see Helleu’s paintings? Paul César Helleu (1859–1927) was born into a bourgeouis but not wealthy family in Vannes, on the west coast of Brittany, in France. His father died when he was in his early teens, so he left home and moved to Paris. In 1876, at the tender age of just 16, he gained a place at the École des Beaux-Arts, where he studied under Jean-Léon Gérôme. 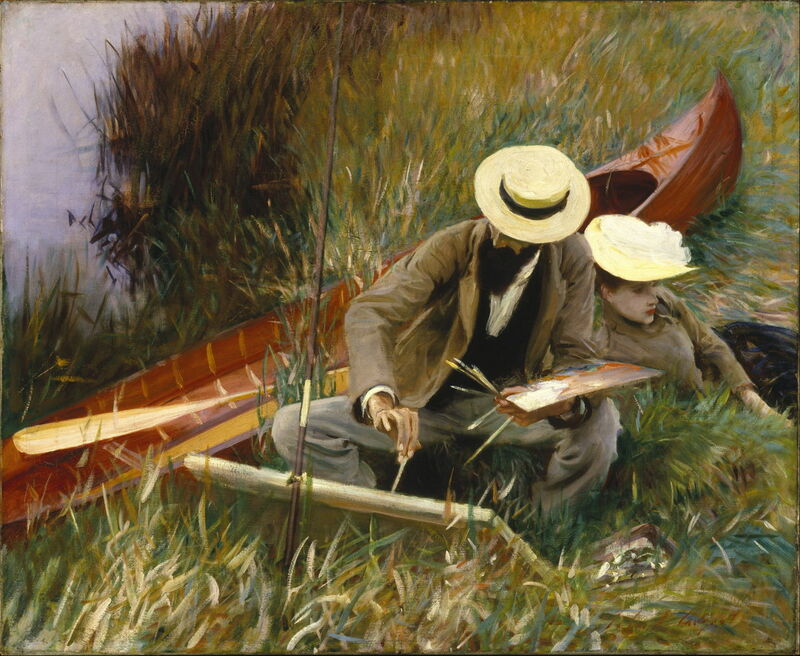 That same year, Helleu attended the Second Impressionist Exhibition, where he was introduced to the paintings of the revolutionary movement, and met John Singer Sargent, Whistler, and Monet. 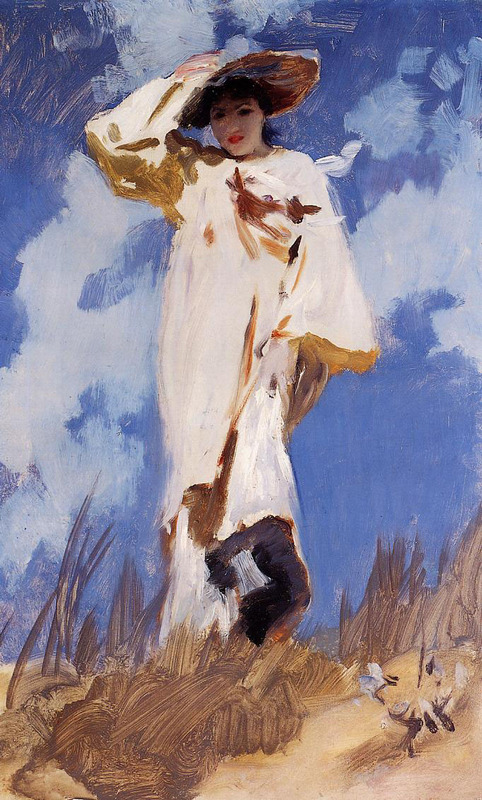 Helleu made two early friends who were to be great influences on his style and career: Giovanni Boldini, and John Singer Sargent. 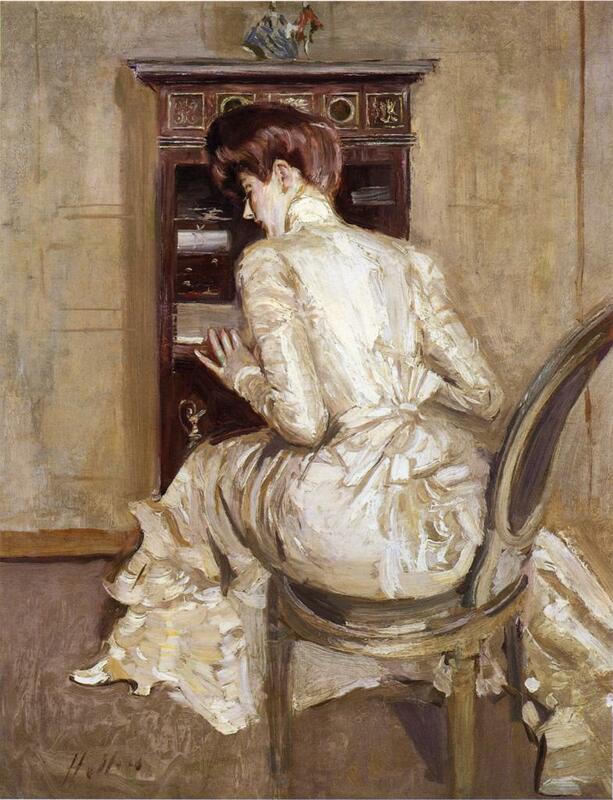 The latter was the first person to buy one of Helleu’s paintings – for the huge sum of a thousand francs. Helleu followed Boldini’s and Sargent’s leads and started to establish himself as a portraitist to the fashionable and wealthy. In 1884, he was commissioned to paint a beautiful girl named Alice Guérin; the couple fell in love although she was only fourteen at the time, and they married two years later. Alice helped introduce Helleu to circles of the wealthy, ensuring that his painting prospered financially. There can be no doubt that Helleu was an extremely accomplished, prolific, and successful painter of portraits. But as with others of his time, such as James Tissot, I here ask whether he demonstrated his talent in other genres, and perhaps justified being rated a fine artist as well. Paul César Helleu (1859–1927), Gare Saint Lazare (1885), media not known, dimensions not known, Private collection. The Athenaeum. 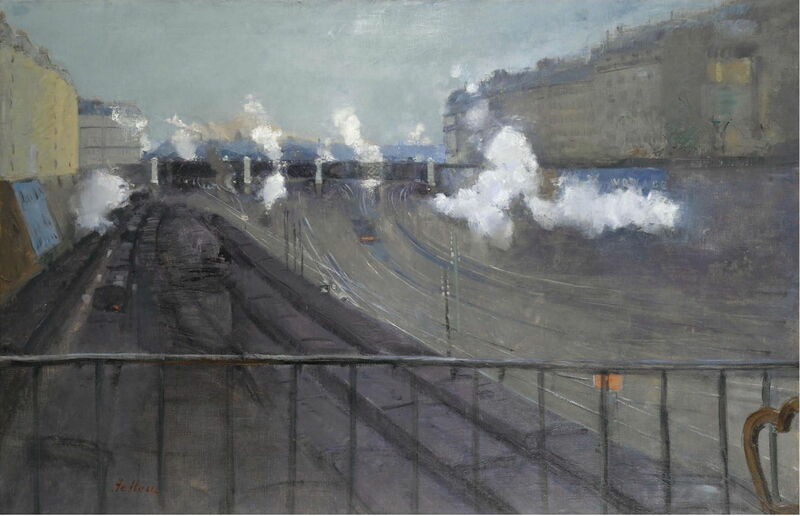 One of Helleu’s earlier Impressionist works, Gare Saint Lazare (1885) offers his version of this motif which had become very familiar with Monet’s 1877 series, discussed here. Interestingly Helleu adopts a high viewpoint which was first used by Manet, rather than Monet. In 1885, he visited London, where he renewed his friendship with Whistler, and met James Tissot, who had been painting portraits very successfully. Tissot introduced Helleu to drypoint etching, following which Helleu became a virtuoso print-maker using that technique. Back in Paris, Helleu became friends with Degas, who persuaded him to exhibit at the eighth Impressionist Exhibition in 1886. That year he was introduced to literary salons of Paris, where he became friends with Marcel Proust among others. His clients were then being drawn from the very highest ranks, and included the Duchess of Marlborough and Helena Rubinstein. Paul César Helleu (1859–1927), The Interior of the Abbey Church of Saint Denis (c 1891), oil on canvas, dimensions not known, The Isabella Stewart Gardner Museum, Boston, MA. The Athenaeum. From about 1890, Helleu explored other genres and themes more actively. 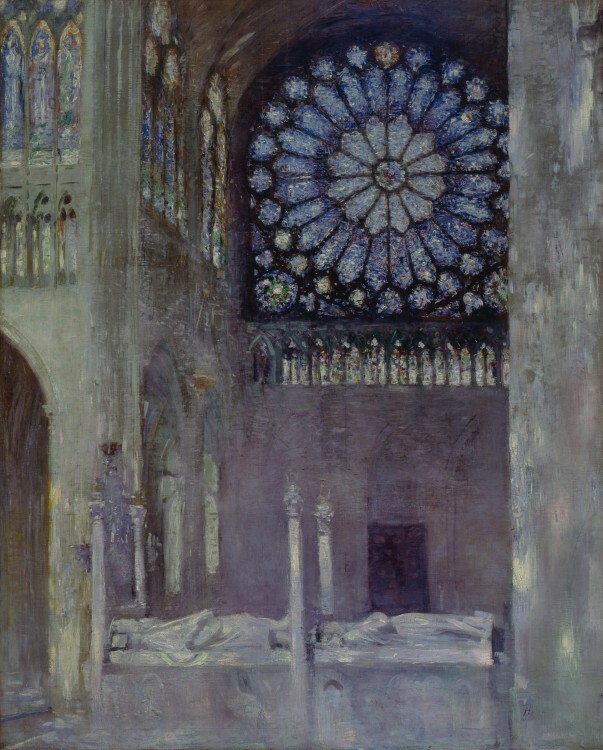 The Interior of the Basilica of Saint-Denis (c 1891) is an example of his interest in churches and their stained glass, which included Reims Cathedral. The Basilica of Saint-Denis was the burial place for almost every French king between the tenth and eighteenth centuries, and now lies within the north of the city of Paris, although Saint-Denis was formerly its own city: you can read more about it here. The window shown is that of the north transept, which features the tree of Jesse; a south transept rose shows the Creation. Paul César Helleu (1859–1927), Vase of Flowers (c 1896), oil on canvas, dimensions not known, Private collection. The Athenaeum. 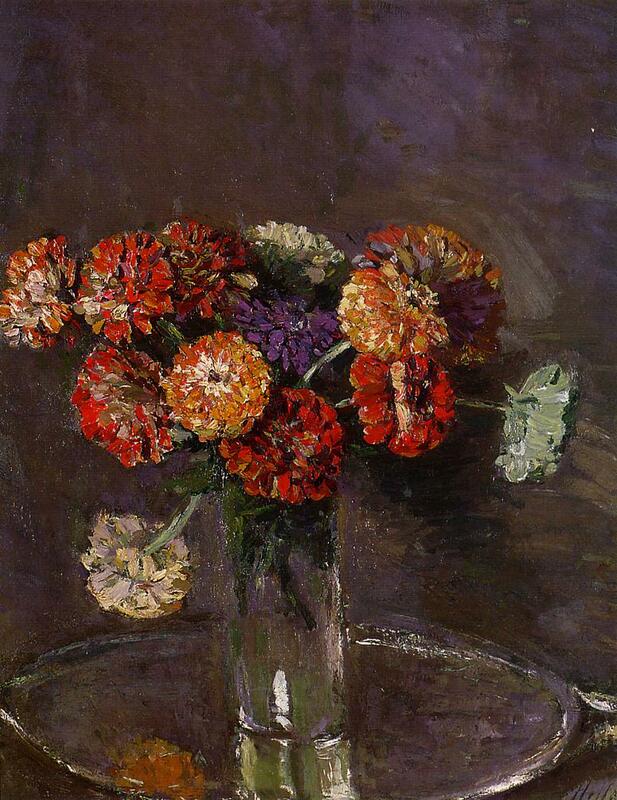 After that series of churches, he turned to floral studies, including Vase of Flowers (c 1896). Paul César Helleu (1859–1927), Aboard (1897), oil on canvas, 65 x 81.5 cm, Private collection. The Athenaeum. 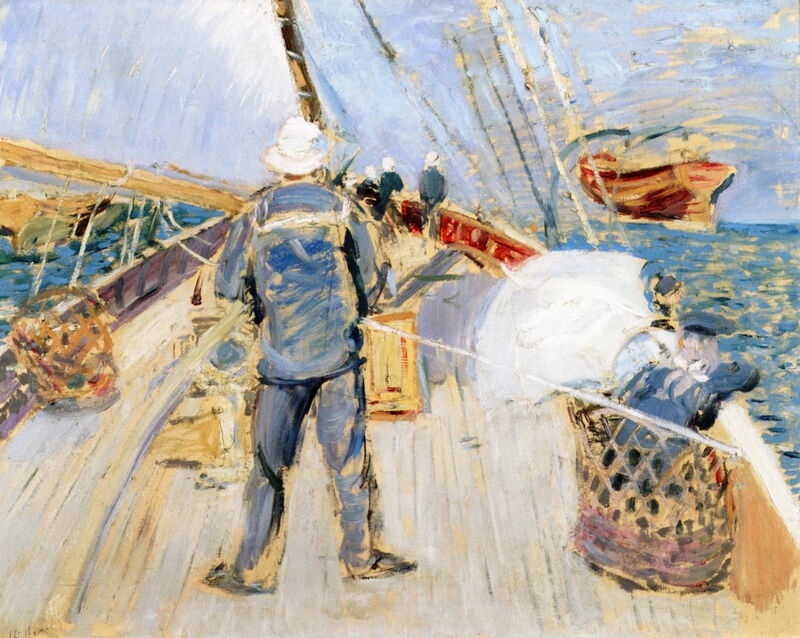 From the moment that he could first afford to do so, Helleu was an enthusiast yachtsman. With commercial success came the ability to own his own yacht, and over his life he owned four in all. 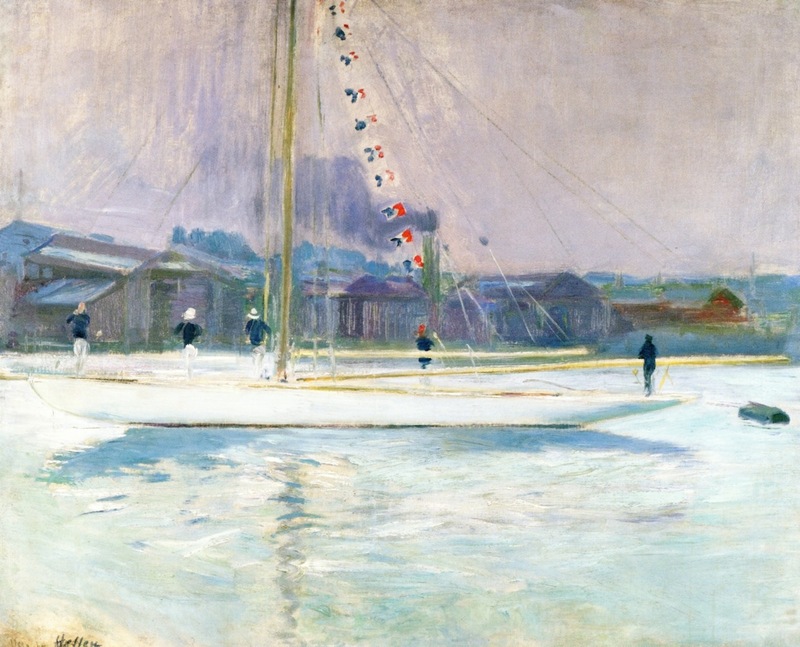 Aboard (1897) is a very loose sketch made on board what appears to be one of Helleu’s sizeable yachts, with two small boats seen in their davits. Paul César Helleu (1859–1927), Portrait of Madame Chéruit (1898), media not known, 80 × 65 cm, Private collection. Wikimedia Commons. 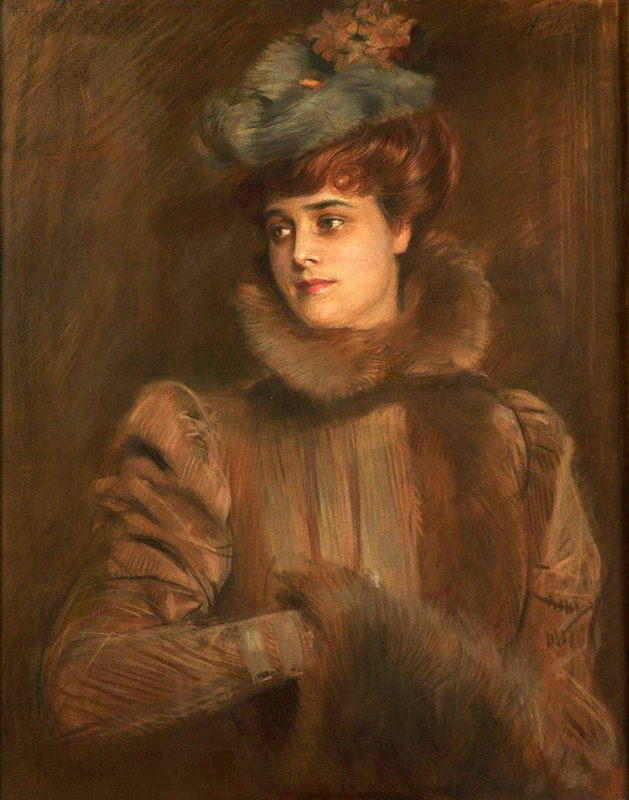 Portrait of Madame Chéruit (1898) shows Madame Louise Chéruit (1866-1955), among the most prominent couturiers of her generation, and one of the first women to control a major fashion house. She and Helleu apparently had an affair around the time that this portrait was painted. His wife Alice was his favourite model, and his most recurrent subject from the time that he first painted her portrait. 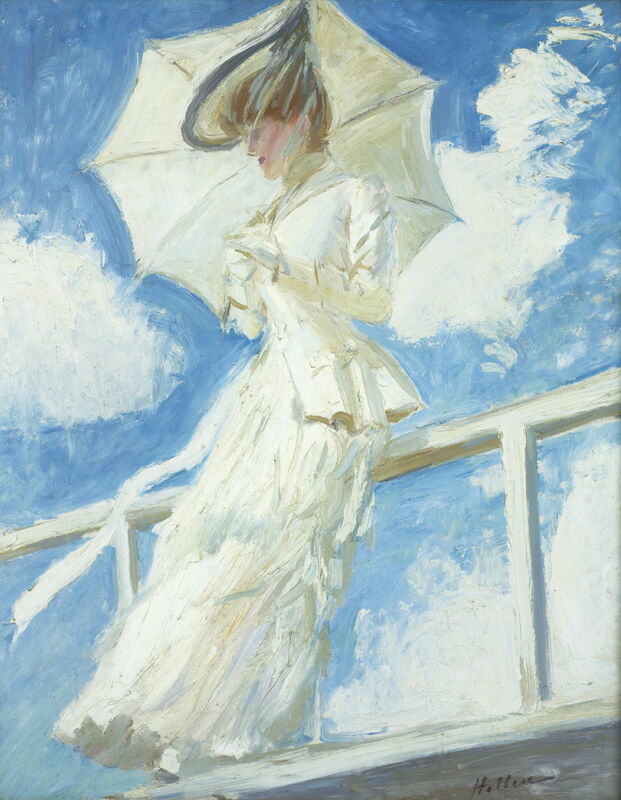 Portrait of Mrs Helleu with an Umbrella (1899) is a very loose sketch almost entirely in blue and white, which seems to refer to John Singer Sargent’s earlier A Gust of Wind (c 1886-7), shown below. Paul César Helleu (1859–1927), Bedecked Yacht Entering Port (1899), oil on canvas, 65 x 81 cm, Private collection. The Athenaeum. 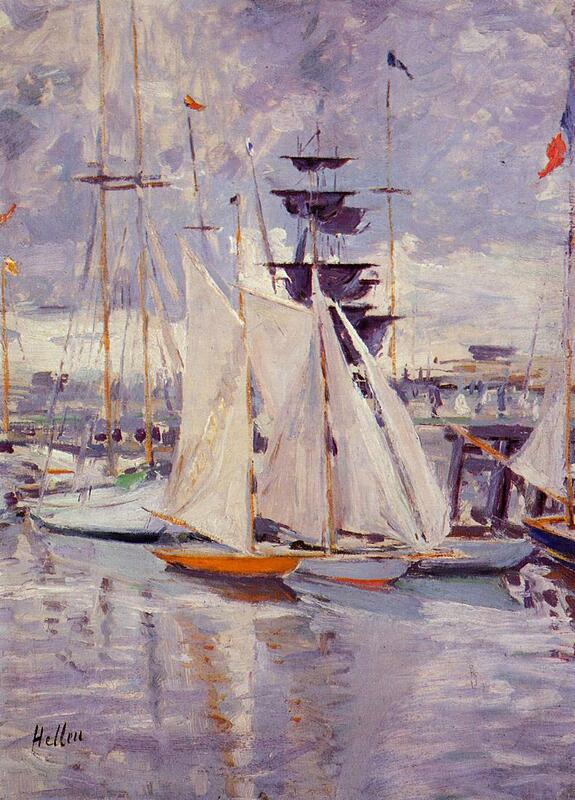 Many of his later paintings are centred on his yachting activities. Bedecked Yacht Entering Port (1899) shows a racing yacht proceeding into harbour under power, presumably after a race. Paul César Helleu (1859–1927), Madame Paul Helleu Seated at Her Secretaire, Seen from the Back (c 1900), oil on canvas, 80.7 x 64.8 cm, Private collection. The Athenaeum. Madame Paul Helleu Seated at Her Secretaire, Seen from the Back (c 1900) is a more unconventional portrait of his wife, who appears dressed for a social engagement. Paul César Helleu (1859–1927), The Flute Player (c 1900), drypoint etching, plate 24 in de Montesquiou, R (1913), Paul Helleu, Peintre et Graveur, H. Floury, Paris, dimensions and location not known. Wikimedia Commons. The Flute Player (c 1900) is an example of his drypoint etching. It is estimated that he produced more than two thousand prints over his career. Paul César Helleu (1859–1927), Regatta (1901), media not known, dimensions not known, Private collection. The Athenaeum. Regatta (1901) is another yachting scene, this time almost certainly a view looking out from Cowes Harbour on the River Medina, Isle of Wight, over the racing grounds of the Solent. At the left is the Royal Yacht Squadron, which still organises the racing. Paul César Helleu (1859–1927), Le Grand Pavois (c 1901), oil on canvas, 65.2 x 81.3 cm, Private collection. The Athenaeum. 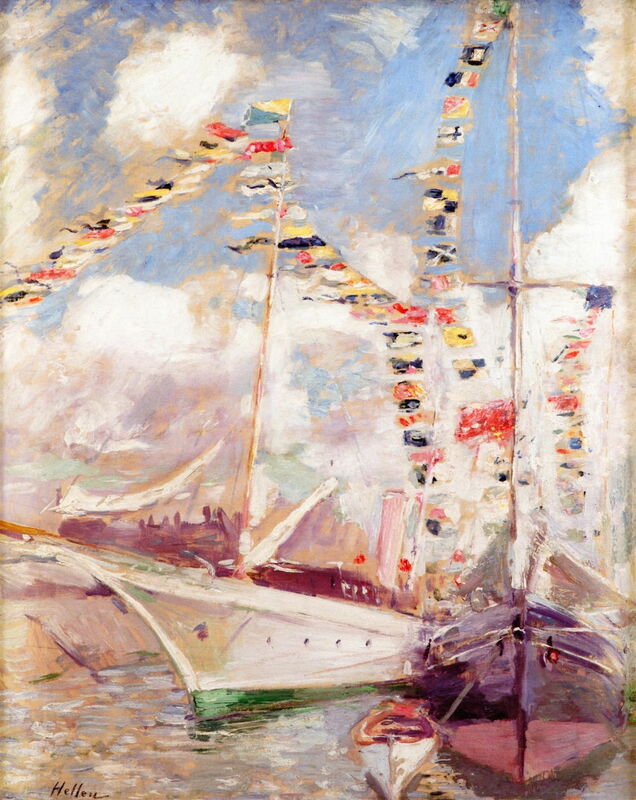 Le Grand Pavois (c 1901) uses the French term for what in English is called dressed overall, and refers to the naval tradition of displaying a rich variety of flags as a mark of celebration or recognition. As in Regatta above, this appears to be at the Royal Yacht Squadron in Cowes, Isle of Wight, and would have occurred during the annual Cowes Week racing, perhaps to welcome the monarch. If painted in the summer of 1901, that would have been for the as-yet uncrowned King Edward VII, whose mother, Queen Victoria, had died that January at Osborne House, her palace on the other side of the River Medina. Helleu had become one of the most celebrated artists in both Paris and London, and in 1904 was recognised by being admitted to the Legion of Honour. On the Beach (1908) is an impressive panoramic view which may have been influenced by the many panoramas which were being shown to the public across Europe. Paul César Helleu (1859–1927), The Harbor at Deauville (1912), oil on canvas, dimensions not known, Private collection. The Athenaeum. 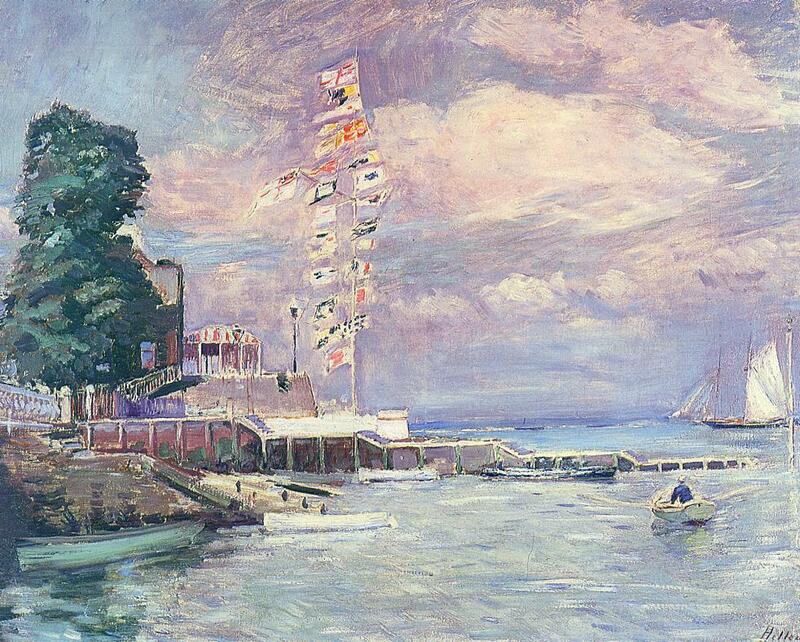 The Harbor at Deauville (1912) is a more static scene from one of Helleu’s favourite French ports and yachting centres, on the Normandy coast of the Channel. The square-rigged sailing ship shown in the background was not unusual: although steam power was becoming widely adopted, there were still a great many sailing ships in commission. During his second visit to the US that year, Helleu was awarded the commission for the ceiling decoration of Grand Central Terminal in New York City. He chose a design based on the signs of the zodiac which was widely admired, but became covered in the 1930s. In 1998 it underwent restoration and you can still see it there today. Paul César Helleu (1859–1927), The Artist’s Yacht, the Port of Sanville (1913), oil on canvas, 81 x 65 cm, Private collection. The Athenaeum. The Artist’s Yacht, the Port of Sanville (1913) shows two grand yachts in Sanville, a port which I have been unable to trace, surprisingly. Either would attest amply to Helleu’s opulence. Helleu was an early friend of Coco Chanel, the fashion designer, perfumier, and businesswoman. 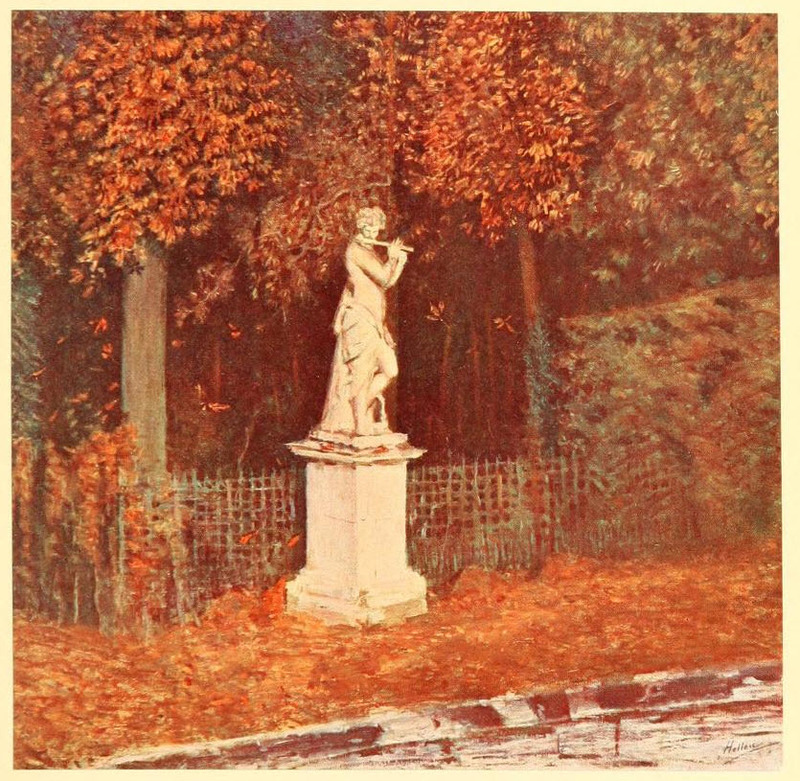 It was Helleu who advised her to adopt beige as a signature colour, and his son and grandson worked as her artistic directors. 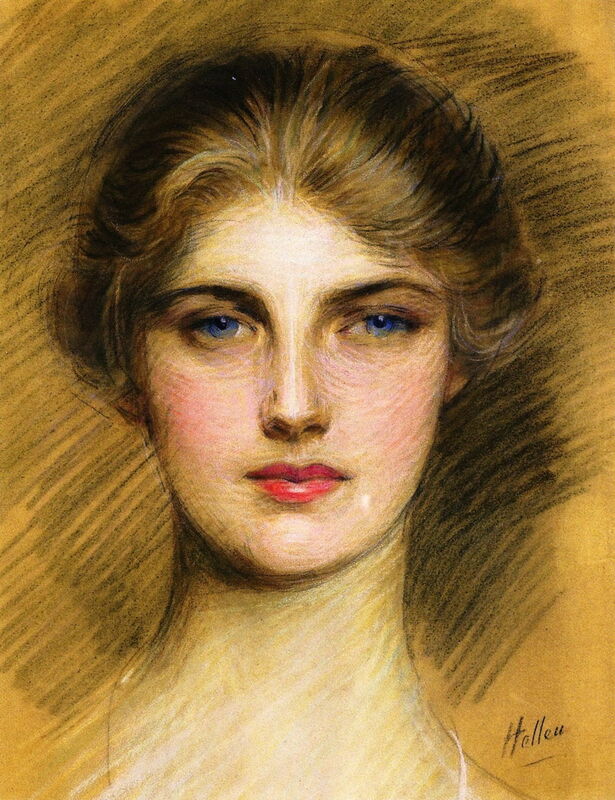 Paul César Helleu (1859–1927), Portrait of a Woman (c 1920), pastel and charcoal on canvas, 40.5 x 32 cm, Private collection. The Athenaeum. In addition to his portraits in oils, Helleu made a very large number of quick sketches of women, including this Portrait of a Woman (c 1920), in pastel and charcoal. Realising that the good and rich years of the Belle Époque were over, after his final visit to the US in 1920, Helleu destroyed most of his copper plates (to prevent more prints being made from them), and went into retirement. He died in 1927, followed by his wife six years later. As with James Tissot and John Singer Sargent himself, this small selection of Paul Helleu’s non-portrait works shows him to have been highly talented, very progressive in his styles, and surely sufficient to merit retention in the history of painting around 1900. The Basilica Cathedral of Saint Denis, with photos and visit details. Posted in General, Painting and tagged Boldini, Cowes, Helleu, Isle of Wight, painting, sailing, Sargent, Tissot. Bookmark the permalink.